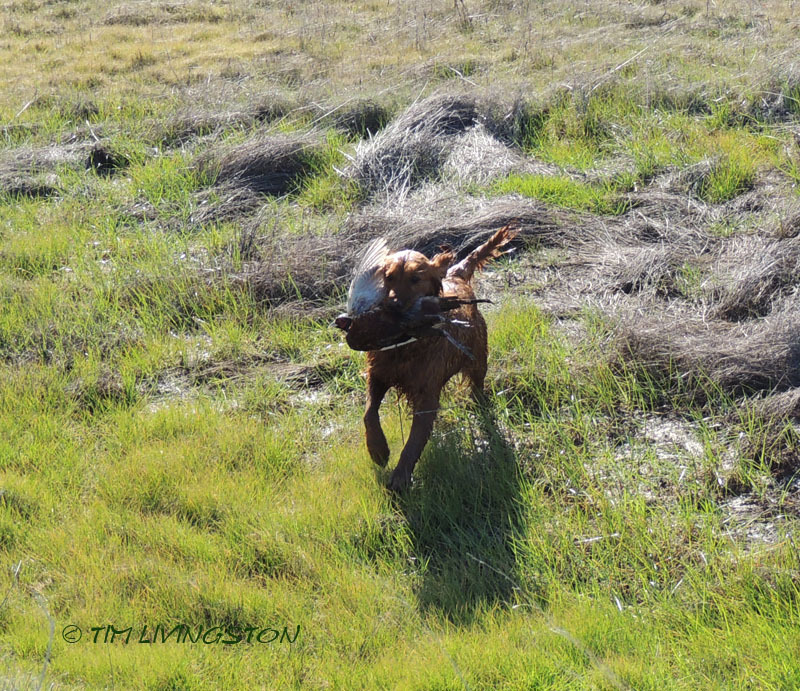 Blitz took me pheasant hunting last week. I think she would drive herself if she had thumbs. Luckily, she needs a gunner tagging along. It’s my joy to watch this girl living her bliss. 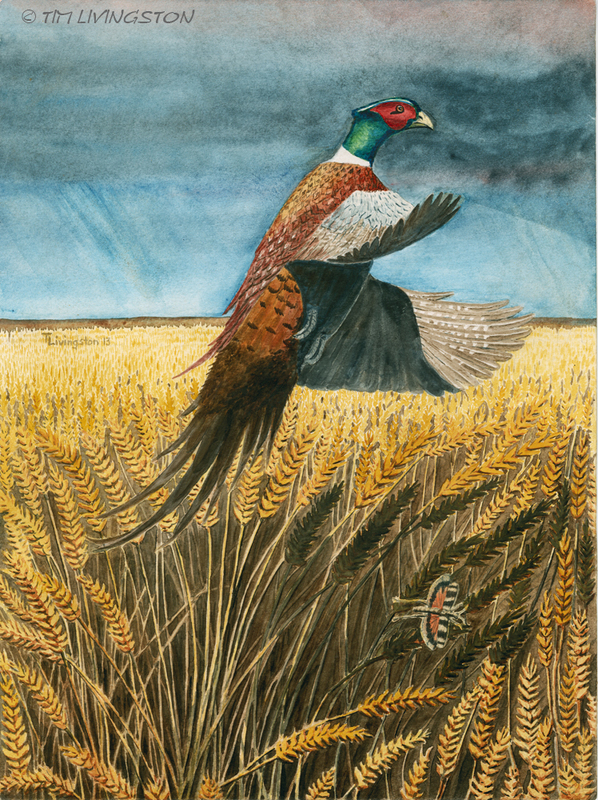 I captured this hunting moment in watercolor, and pen and ink. This painting for me is more than a picture of a beautiful rooster pheasant. It is me trying to express the essence of something in my life that is significant. This painting has been on the board a long time. It is destined for my office. Oddly, I’ve never hung any of my art in my office. I guess it is about time. Pheasant season ended a few weeks ago. It is a time when our dogs get to live their bliss, as Mary is so fond of putting it, living-bliss. 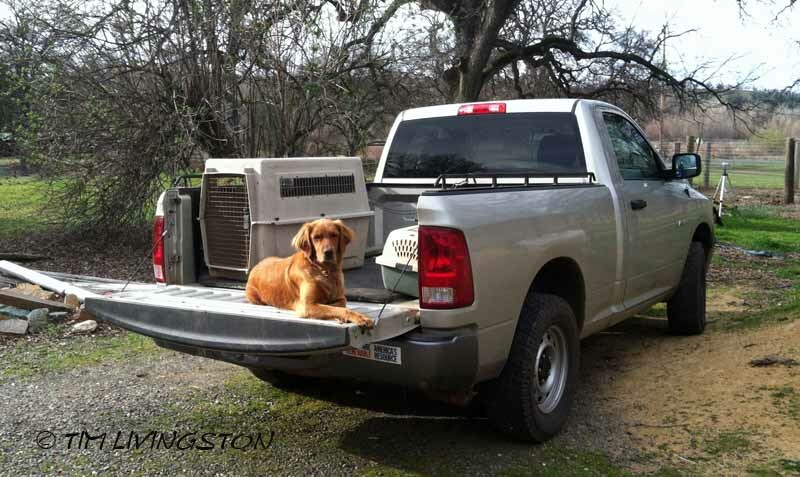 I’ve re-blogged her post, because it is also about the dogs doing what they are born to do. 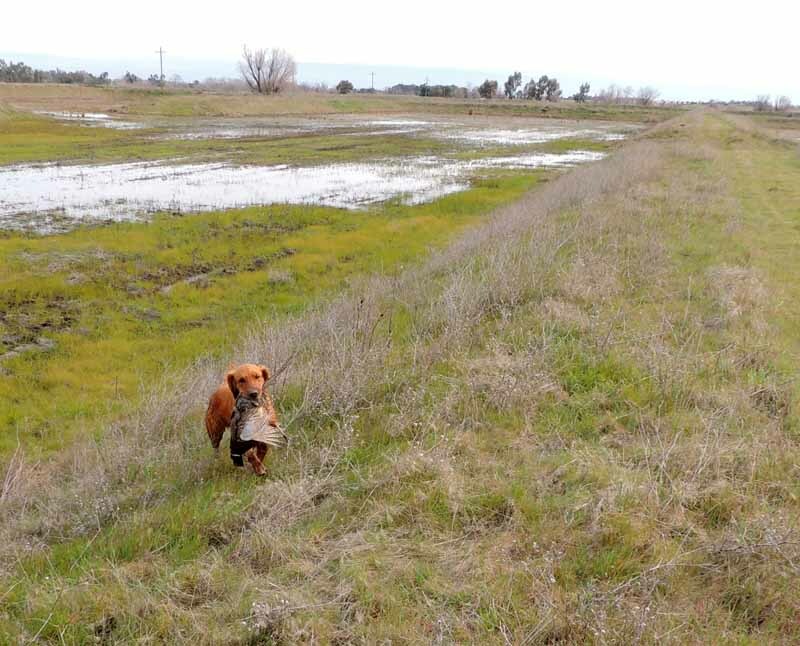 They are working dogs and hunting is their work. They are happiest when they are working. What they do is written in their DNA. I suppose the same is true for me. If I was plopped down in the American West 200 years ago I think I would have been perfectly happy. 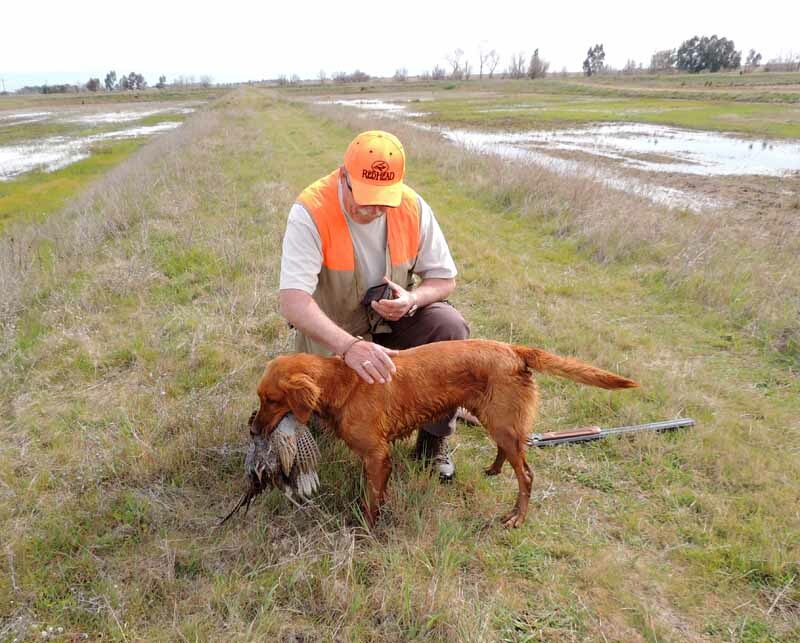 Engaging in hunting with dogs, friends and family keeps me connected to my roots and more primitive self. 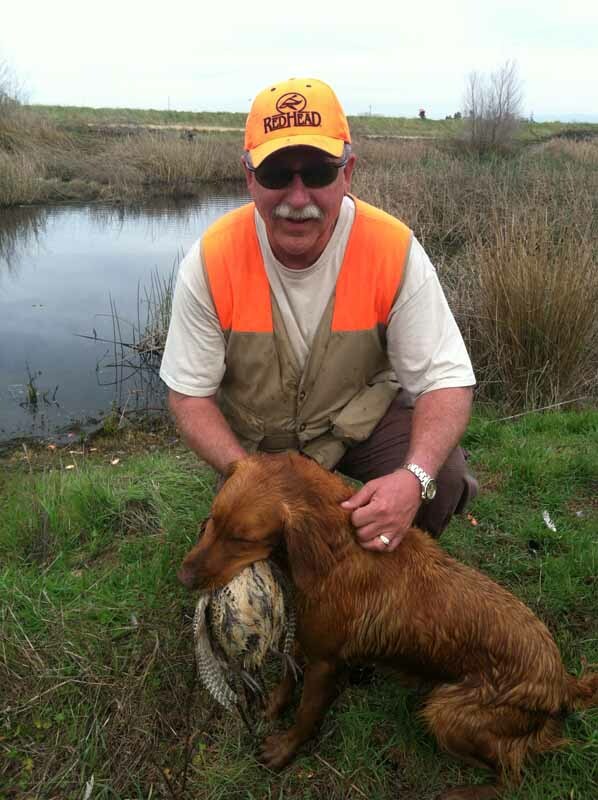 Teka delivers a pheasant to her person, Doug. 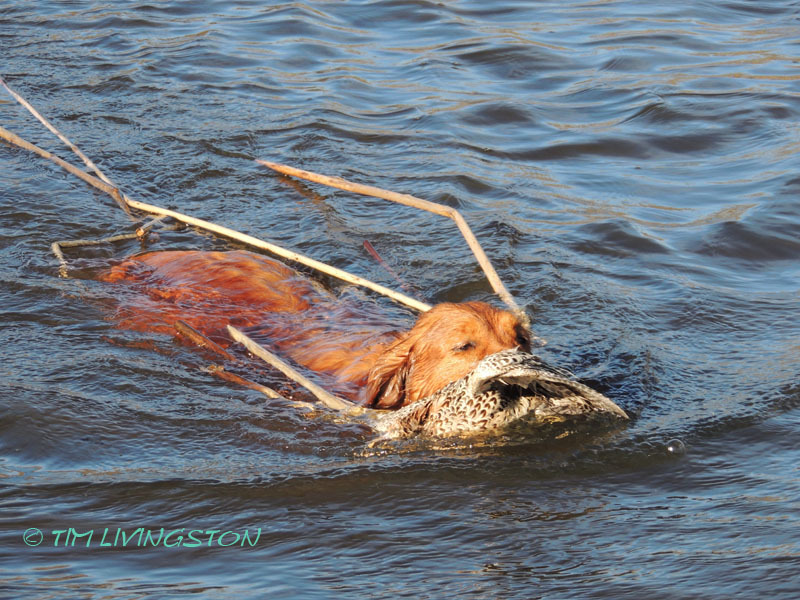 Dogs are pack animals and pheasant hunting helps them live their pack experience. The difference is that we are now their pack, but the satisfaction to them is the same. Teka relishes bringing the bird to Doug and receiving his appreciation. 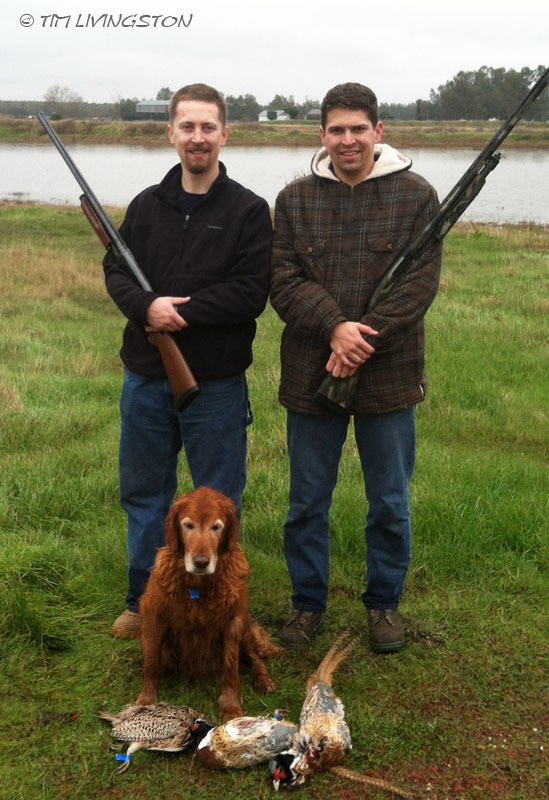 If I didn’t have bird dogs I probably wouldn’t bird hunt. The pleasure they bring to it is what makes it complete. These dogs have such heart in what they do. 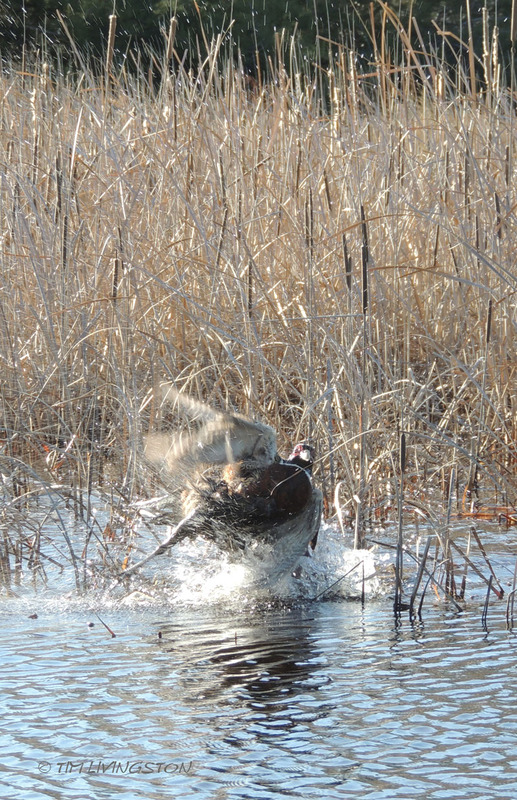 Hunting without them would be like dancing alone. Procuring food is such a basic human activity. By acquiring food myself, I appreciate the meal much more. To spend the time hunting and experiencing the joy of success with my partners makes me think about what our hunter gatherer ancestors did on a daily basis. Then to have to go through the process of cleaning and preparing this food, it puts me very in touch with the reality of what was given. 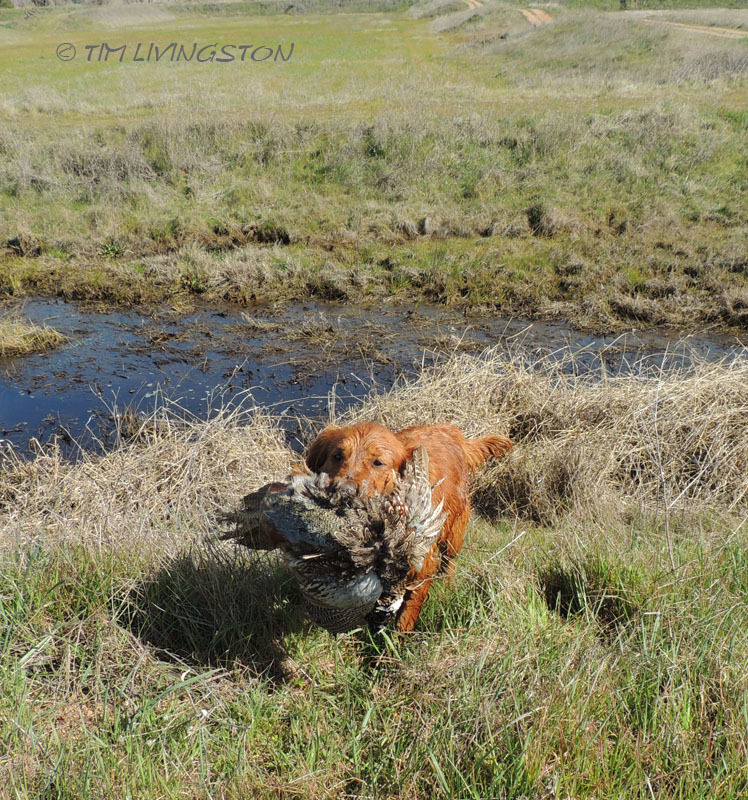 When I hold the pheasant in my hand that I just killed and Blitz just fetched, I experience a blend of feelings. There is joy in the success and satisfaction of providing this meal to my family. There is appreciation for the beauty and for what this creature lost, it’s life. That leaves me with some sadness, but it is the reality of life. It causes me to not take meat in the grocery store for granted. The time out in the field away from the day to day activities is a welcome break to go enjoy a more primal experience. There are things all around to be noticed that add to the richness of this time spent. 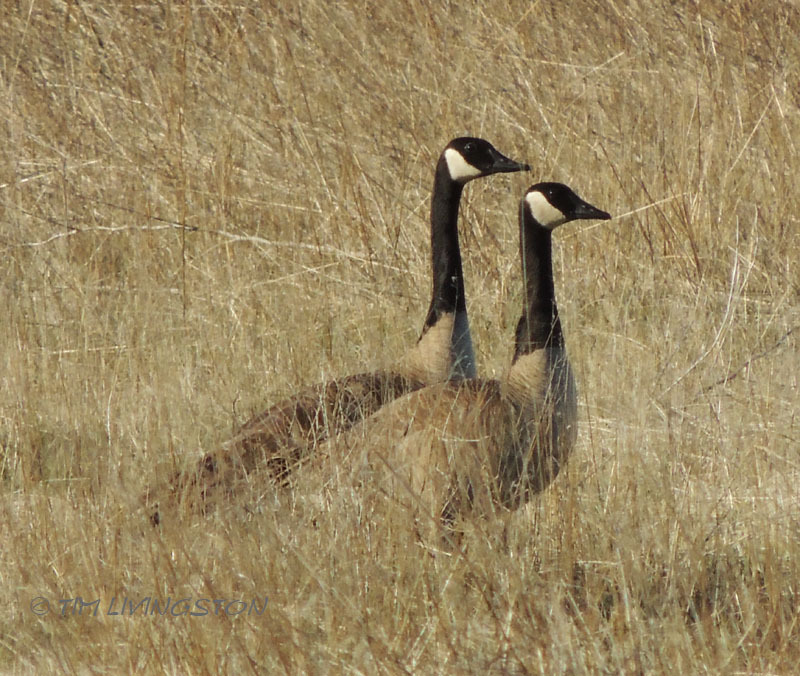 Canadian Geese hiding in the grass. This time means so much when spent with family. My oldest son, Chris with his girl Nellie. 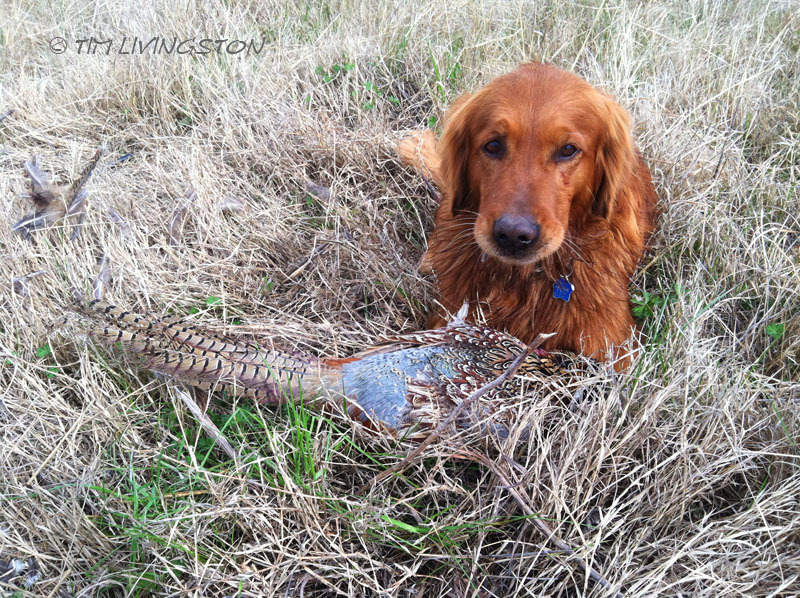 This will be her last pheasant season. This is also a time for me to remember my old loyal hunting partners from years past. The ones that gave me so many fond memories. Last year was Hawk’s last season only we didn’t know it at the time. He should have had many more pheasants to retrieve. We miss him very much. Mary posted about him a while back, Her Papa’s Eyes. 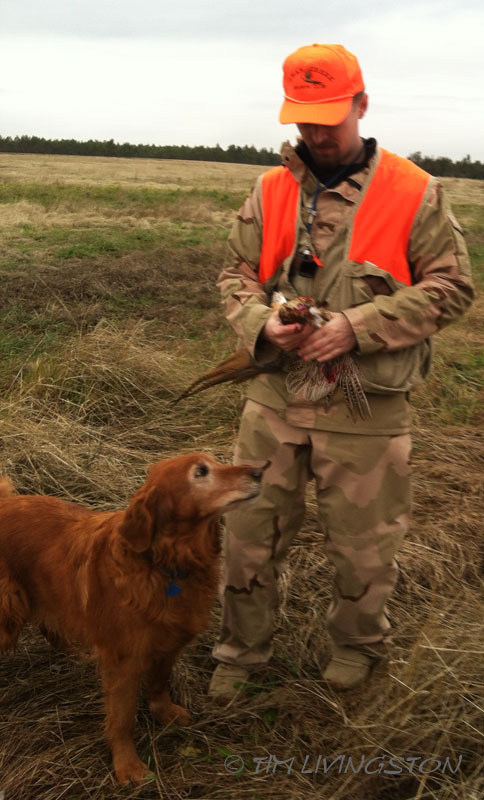 Hawk during his last pheasant season. An old hunting partner remembered. 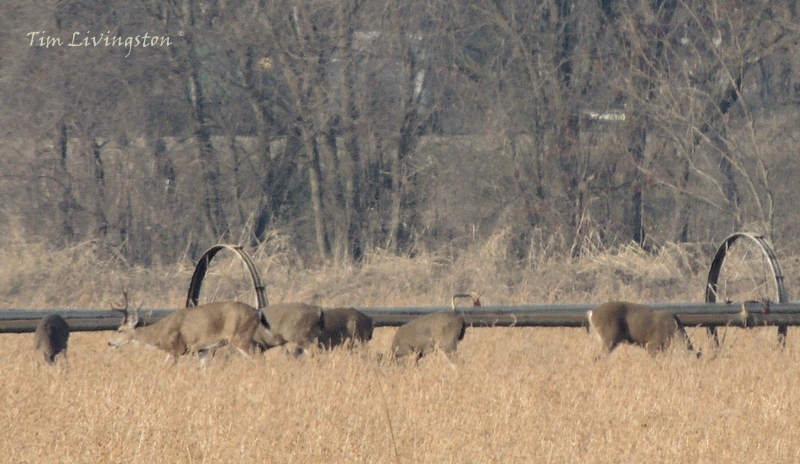 The deer herd feeding in the hay field. Something caught my attention, while cruising around the North end of the log decks. Lots of animals were running in the hay field. The mill property has a couple hundred acres of hay fields and ponds on the North end of the log yard. Each afternoon a large herd of deer comes into the fields to graze. This morning, they were already in the field and running all over the place. This is odd behavior for the deer because they weren’t leaving. They usually wander randomly around the field feeding. If anyone gets too close they just leave the field for the cover of the nearby Valley Oaks. This time they were running helter skelter around the field, but not leaving. I was about a quarter mile away and could not discern what was going on. I pulled out my camera and zoomed in on the action. Then I saw the three coyotes. This is what happened next. Enjoying the sunny morning, the deer placidly graze. They seem unconcerned about anything going on around them. 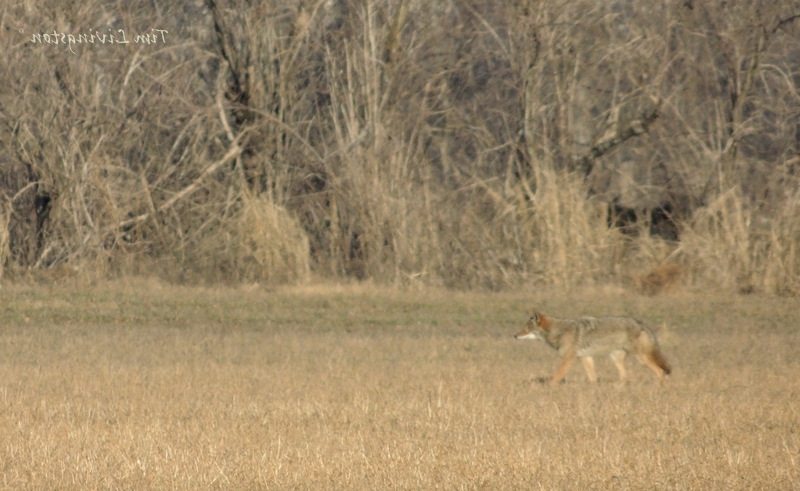 Moving in on the deer herd, this coyote was intent on having venison for breafast. 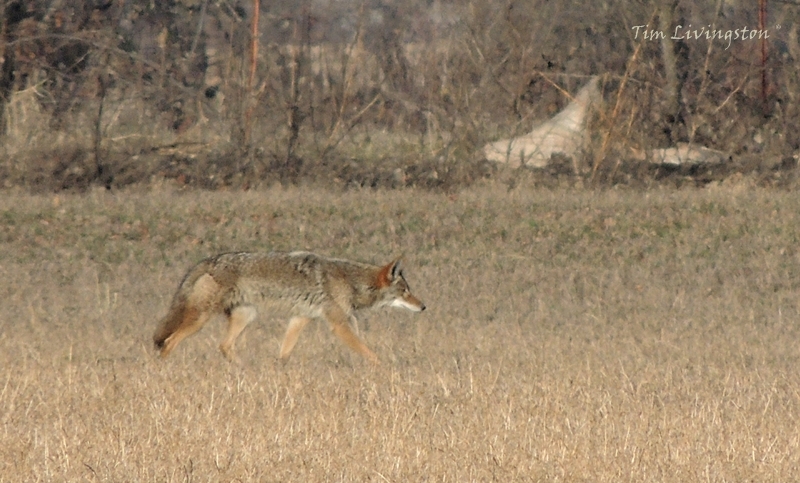 The coyotes non-chalantly move closer and closer to the herd. 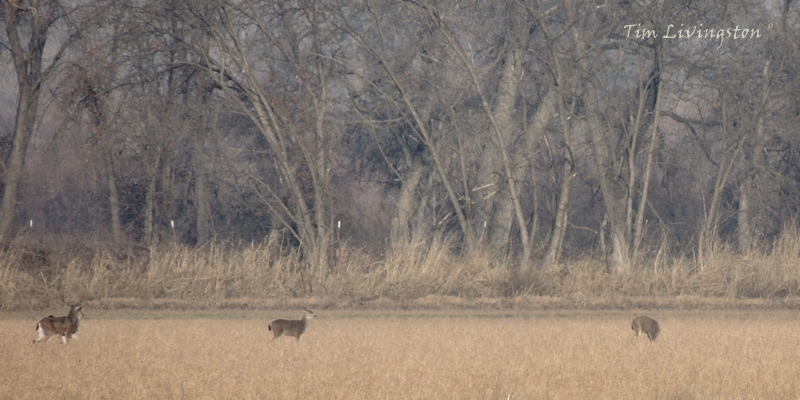 The big buck spots the sneaky coyotes. 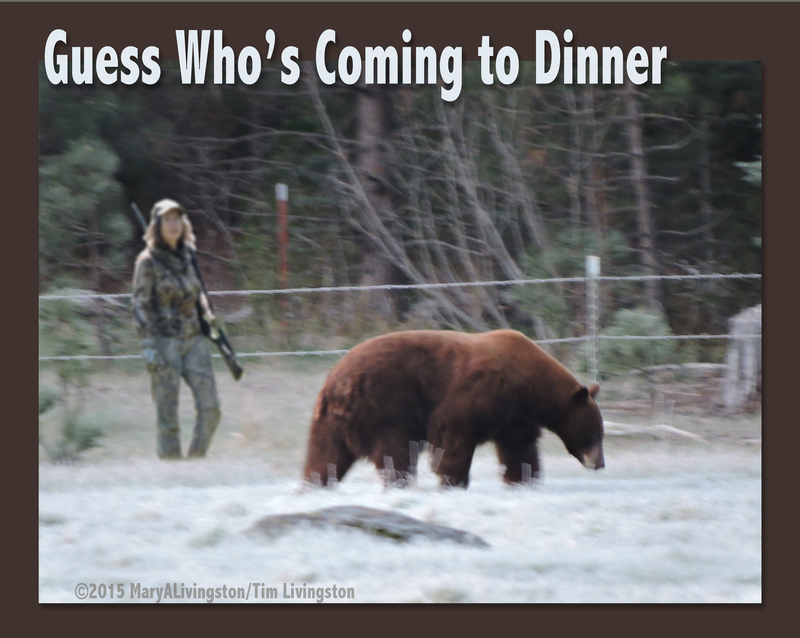 Two does and the big buck aren’t going to tolerate the coyotes stalking the herd. 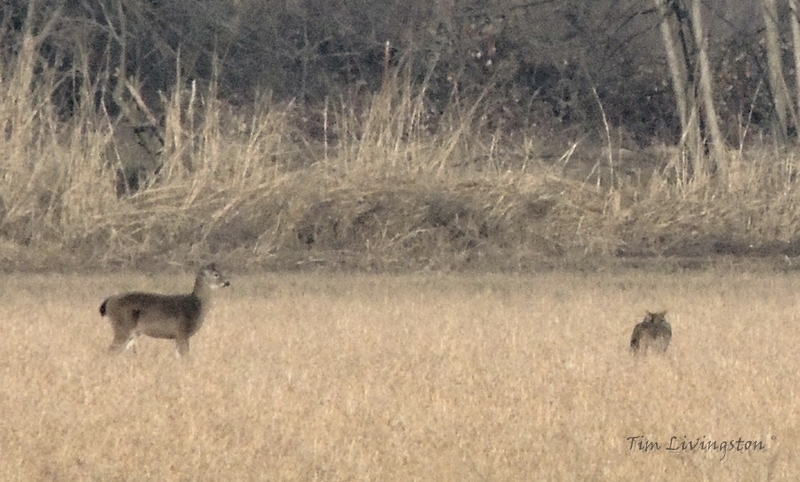 This brave doe takes the lead in dealing with the interlopers. 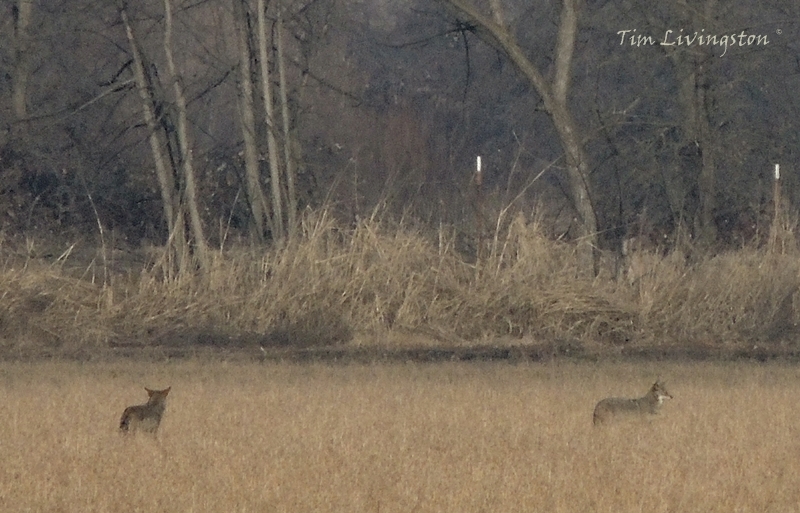 The two does surround the lead coyote. The coyote was not expecting this. 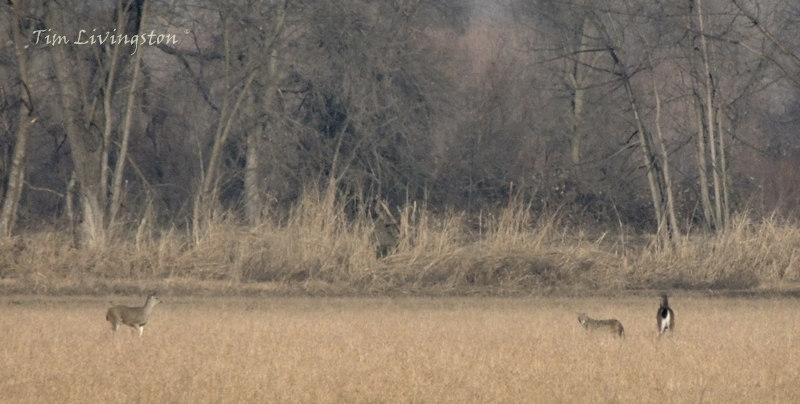 The second coyote decides not to stick around. No loyalty amoung coyotes. 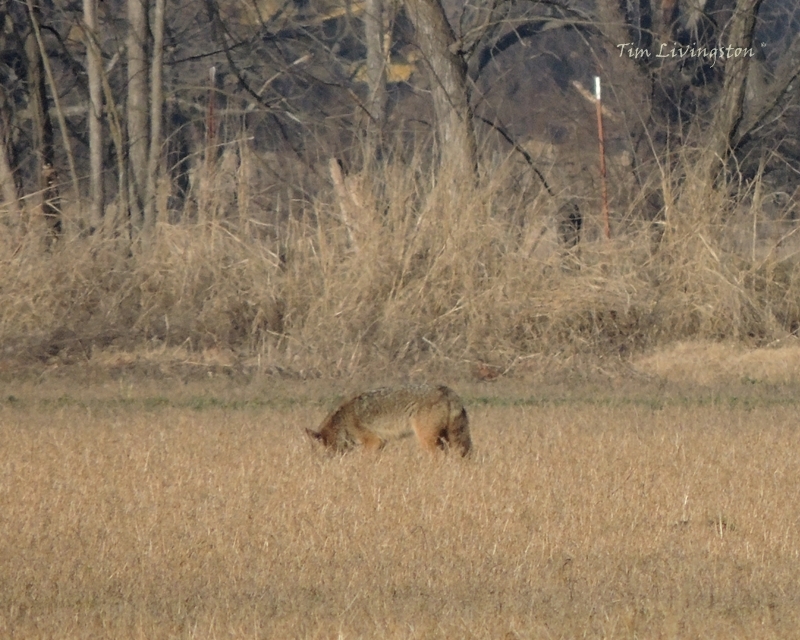 The coyote is having second thoughts and a venison meal. Deciding it isn’t worth it the coyotes back off. No venison today for this coyote. Perhaps a nice field mouse would be good instead. With the threat dealt with, the herd goes back to a leisurely breakfast.